We stock both Cosyfeet and Sandpiper ranges of boots. A stylish boot with lots of stretch! These warm and comfy, softly-padded boots are ideal for swollen or problem feet. The front part of the boot is made from soft, stretchy Elastane which won’t put pressure on painful toes, joints or swelling. The back of the boot is made from soft Leather so they’re very supportive around the ankle. Team them with boot-cut trousers or jeans for a stylish, seasonal look. At last, a boot that is easy to put on and off. With the very wide opening and the low cut back, this really is a boot for problem feet. The deep cushioned padding around the ankle and on the tongue keeps your foot snug and secure, while the removable insole gives you even more room for thicker socks! 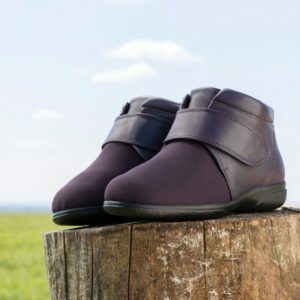 The sleek lines and plain design of this boot is what gives it the style, yet the wide openings and the warm lining is what will make sure it is not forgotten. An ingenious development for very wide feet, this disguises awkward feet and keeps them warm in cold winter weather. Suitable for diabetics. Extra wide 4E-6E fitting. Bali is perfect for those with extra wide or swollen feet. Available in two striking colours, Bali looks set to be a popular addition to the range. Single strap touch fastening ultra wide 2 in 1 fitting, men’s casual ankle boot. Soft, comfortable and accommodating. Suitable for diabetics.